Now that Melanie is older and little calmer, we're starting to go out and enjoy fun activities as a family. 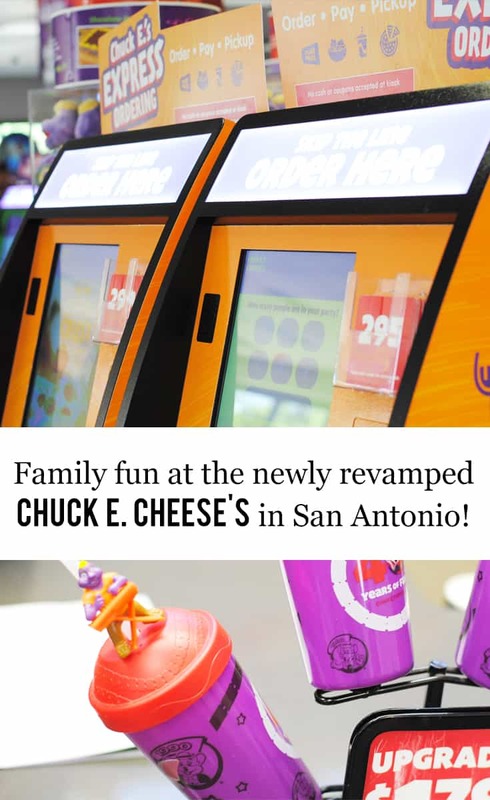 We go camping, swimming, and ride bikes at the park and recently, we were invited to visit one of the family-friendliest spots on Earth – Chuck E. Cheese's! Y'all, I have fond memories of visiting my local Chuck E. Cheese's (can you believe that little ol' Fairbanks, Alaska had one?) and playing in the ball pit for hours. 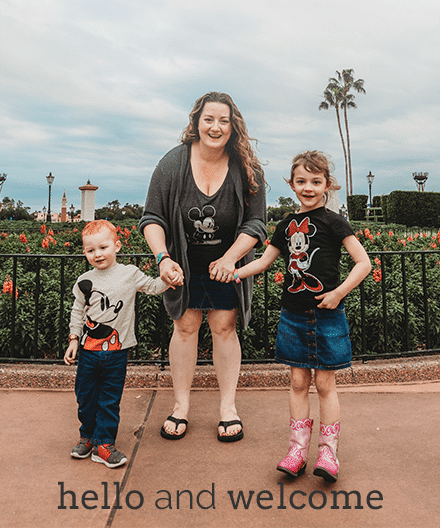 I knew that Melanie would have a good time but I didn't know how much I would enjoy it (or what Finn would think) since my memories were of a place more geared toward kids than adults. 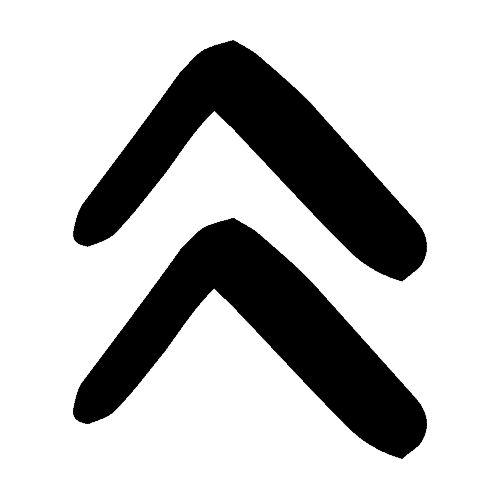 Oh man, y'all – Things. Have. Changed. Don't believe me? 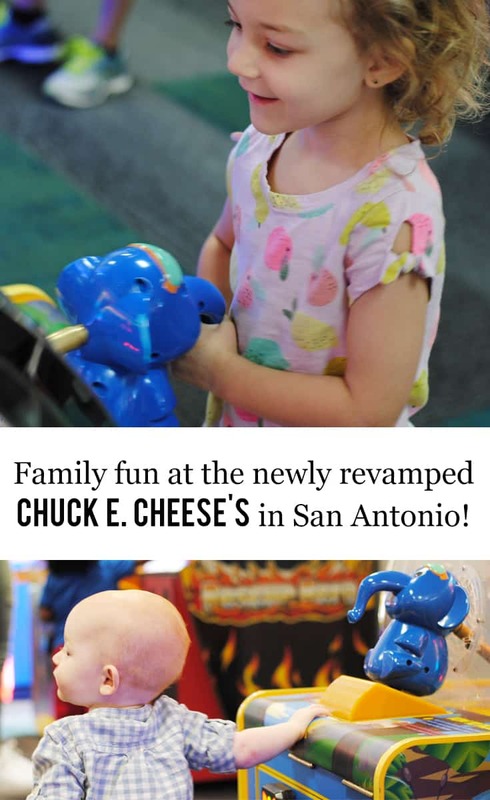 Check out how we ALL had some family fun at the newly revamped Chuck E. Cheese's in San Antonio! First, the atmosphere. They've done away with the orange and red buildings that you probably remember and have replaced them with open, airy spaces. The colors are bright and happy. 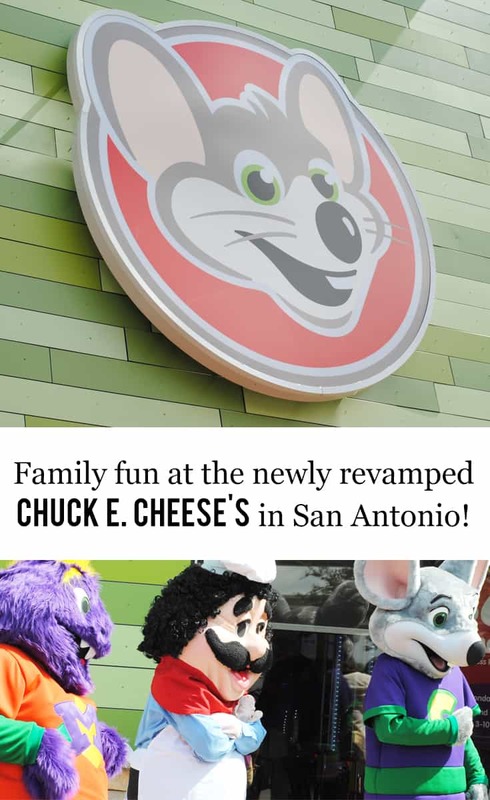 There's definitely a more grown-up vibe with all the warm woods and neutral tones which I felt makes it more inviting and friendly (You can definitely tell that Chuck E. Cheese's partnered with the San Francisco-based design firm, Tesser, for the updates to the San Antonio-based flagship restaurants.). The bathrooms are large and can easily accommodate strollers or wheelchairs. There's a really cool light-up dance floor where you can join Chuck E. Cheese's characters for a live show every hour (and a special show for birthdays). Finn was enamored with that dance floor, y'all. It's still super easy to do a birthday party at Chuck E. Cheese's, too. There's a new Birthday Zone features varied seating options for larger parties , with party sections designated by characters in Chuck E.'s band featuring a bold wall graphic silhouette and character biography. It was really cute and well organized. There was actually a birthday party going on while we were there and it was so well-organized! Let's talk about the food. Gone are the plain old pizzas from my childhood and in it's place is a completely revamped menu! Oh, sure. There's still pizza but it's made from scratch every single day in an open kitchens so everyone can watch the pizza making process. 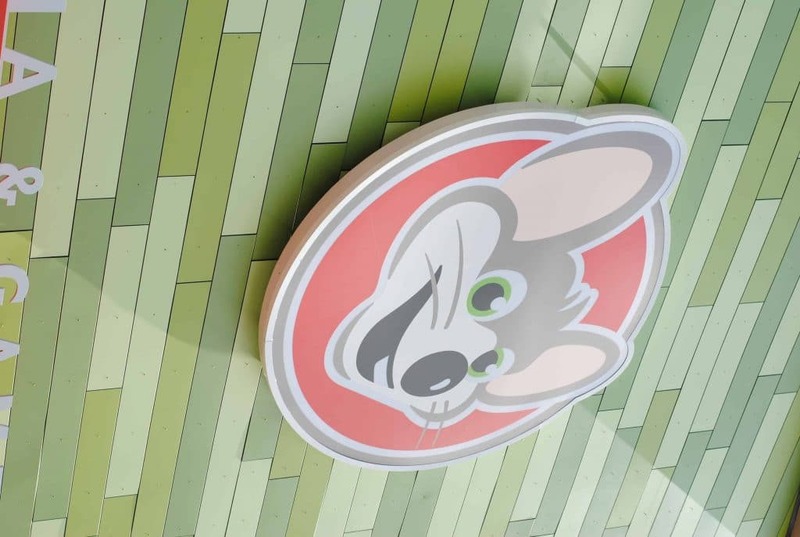 Additionally, Chuck E. Cheese's offers a lunch buffet Monday – Friday from 11 a.m. to 3 p.m. (located next to the open kitchen) and it's packed with fresh ingredients on the pizzas in the salads. Salads? YES. Salads. In addition to offering a variety of salads, Chuck E. Cheese's also serves boneless chicken wings, desserts, and so. many. yummy pizzas! I tried one with mushrooms and spinach and it was straight up delicious. Be sure to use the new self-service kiosks by the entrance to order off the menu instead of waiting in line! Lastly, let's talk about the games. I mean, we all know that's what your kids want to do there anyway (I had to drag Melanie away from the “Paw Patrol” game). Remember when you had to stand in line and get a mass of tokens to play any games? No anymore. Now, Chuck E. Cheese's has an innovative “tap-to-play” Play Pass game card system, which allows parents to load “tokens” on a card. Then, you just tap the card to play! No tokens weighing you down or getting lost. I really loved that the cards would also tell you how many “tokens” you have left (there were also mini kiosks around the game areas that would either reload your card or tell you your balance – super handy!). It's so easy for adults and kids alike to enjoy almost a dozen newly installed games in the remodeled game rooms. Y'all, Melanie had such an amazing time at this event and we really enjoyed all positive changes to Chuck E. Cheese's. Now, when we see their commercials on TV or pass by the location, Melanie tells me all about how she played games and ate pizza there. Yeah… I think we'll be heading back soon! In the meantime, you can check out all the changes at a location near you, on Facebook, Twitter, or Instagram!